Scarlett Sieber is SVP of Open Innovation and Ecosystem Building at BBVA. She implements the innovation global strategy and vision within the US and heads the North American region for BBVA’s global fintech competition, Open Talent. Scarlett is also the US lead for BBVA’s millennial initiative. Prior to BBVA, she was COO and co-founder of a data visualization tech startup, Infomous, whose clients include The LondonOlympics, Super Bowl XLVII, and NFL Films. Outside of work, she is a contributor to the Huffington Post, Forbes, and WeWork. 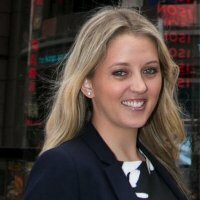 She is a NYC Fellow for Startup Leadership Program. Scarlett is 1 of the 500 Global Youth Ambassadors for A World at School that, in collaboration with the Office of the UN Special Envoy for Global Education, is a global movement of young leaders working to get every child access to education by the end of 2015. She is also an Ambassador for One Young World.